My wife frequently tells me I am obsessed with LEGO. 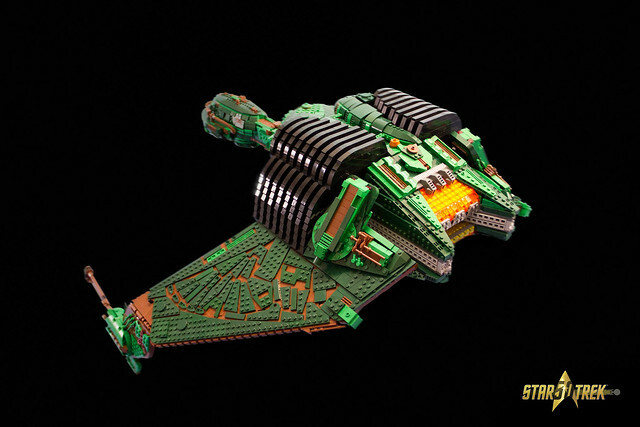 But believe me I’ve got nothing on Kevin J. Walter, who has spent the last 15 years trying to build a perfect LEGO model of the Klingon Bird of Prey from Star Trek. 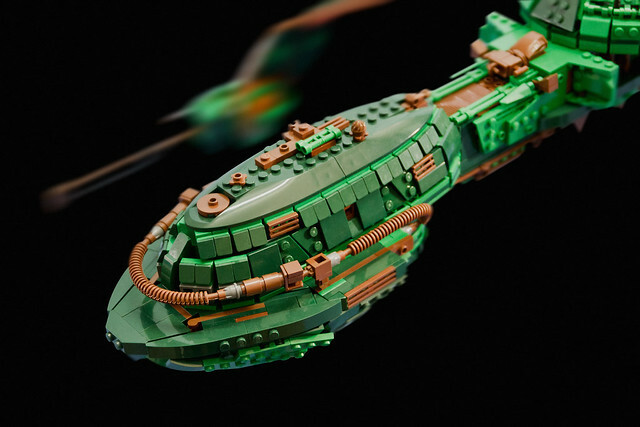 He’s recently achieved that goal and the results are astounding; so rather than just write about how mindbogglingly awesome his model is, we decided to ask Kevin a few questions about it. Spaceshipspaceshipspaceship.net: I think I read you were working on this model for 6 years?!? Can you clarify? 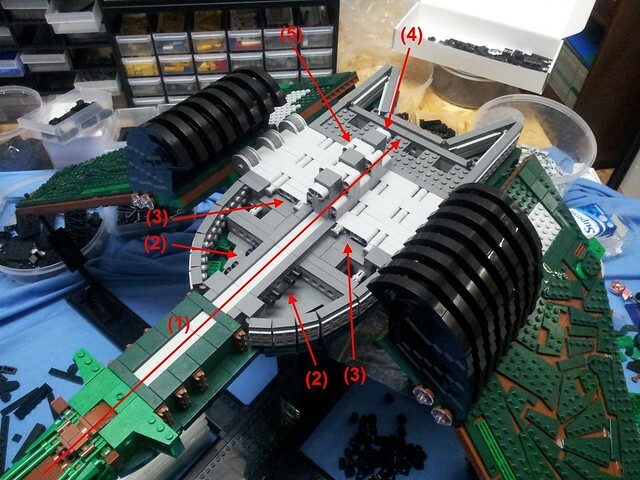 Kevin J. Walter: Since I saw it on screen for the first time during my childhood, building a LEGO Klingon Bird of Prey (BOP) has been my dream! I immediately started building ships that looked more-or-less like a BoP, the first of which was the Phoenix built around 2002. A year later I decided to build the Pheonix II, and this time I used blueprints of the BoP to get the outer shapes as good as possible (for a 13 year old boy…). The pictures below show the underside, with doors for a hangar in the upper sections of the ship as well as gaps for landing gear. As you can see it was quite big… and, as I would soon learn, far too ambitious and expensive for me to actually finish. So I rejected the project and a good time passed before I was ready to try again. Kevin: Five years later I started on a virtual rendition of the BoP using POV-ray software. By February 2008 I had only finished the “head” – it took me two full years to complete the digital model. You can find the WIP journals here and the finished rendered pictures as well here, including stats etc. (SSS: this model uses over a quarter of a million bricks…) But even afterward I kept thinking how I could build a BoP with real bricks. I tried to find new references, and stumbled upon a ton of pictures of the studio model used for the Star Trek movies. 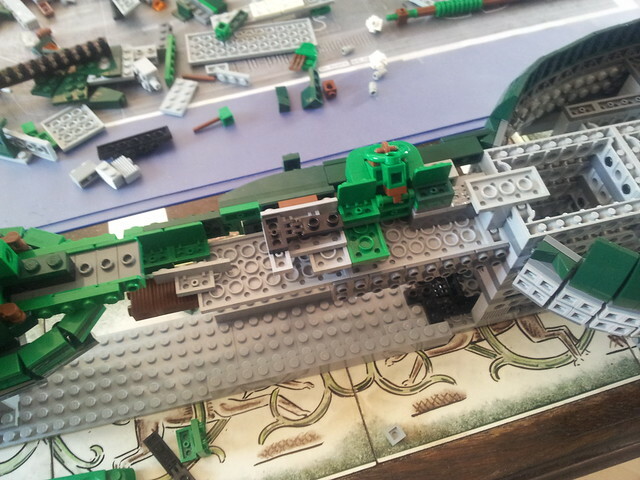 Next step was to research which LEGO parts were available in different green tones and how big the variety of them was. 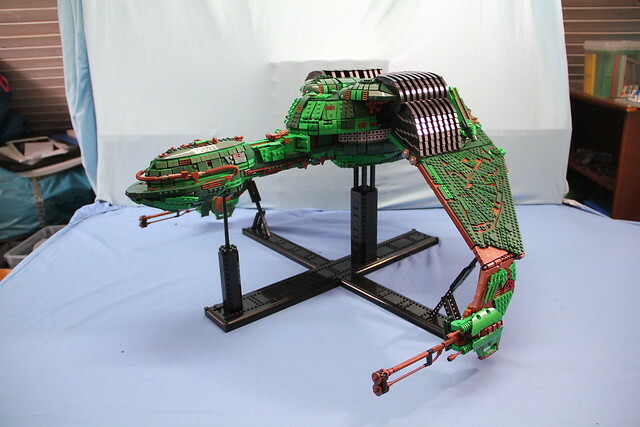 I decided to go with Green and Dark Green as the main colors, with Reddish Brown details to capture the rusty look of an old Klingon ship and added a bit of Dark Orange here and there. Finally, in mid 2015 I started building. Kevin: The model took me another year and a half to complete and I had many difficulties to overcome. The many complex shapes and curves in nearly every section of the hull and head were a real pain to solve, but were nothing compared to the feather patterns on the wings! I had to re-build the wings three times until they were stable enough and I was happy with the pattern. Summarizing all the efforts I put in on the journey from my childhood to the present day I have to say: I’m more than lucky that after 15+ years of building BoPs or something similar, I can now look on this beauty on my shelf (actually my table. It’s way too big for my shelf…). SSS: How did you decide the scale of the model? Kevin: That’s a good question. I started with calculating different scales for the reference. 1mm on paper = 2 studs was far too big, so I shrunk it down 1 mm = 1 stud, made a few experiments with it and realized it was STILL too big. I shrunk it down another time to the final scale 1mm = a half stud. I tried this scale on different sections of the model. How big would the hull be? How long the span of the wings? 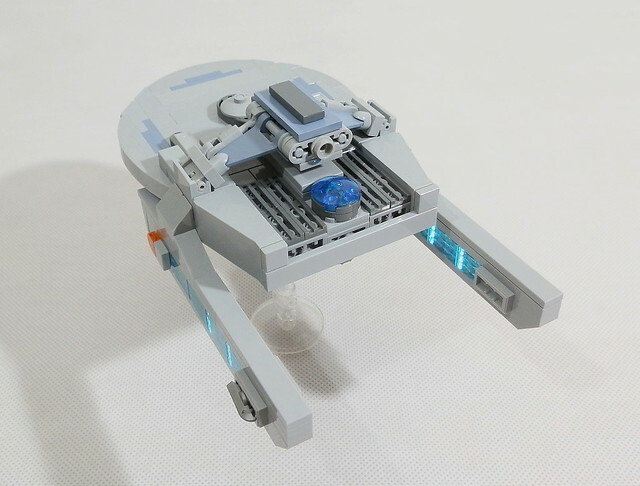 In this way I worked out the complete model, following the strict guidelines of the references (except a little tolerance of maximum 2 studs here and there). SSS: How strong is the completed model and how did you ensure it would be sufficiently strong? 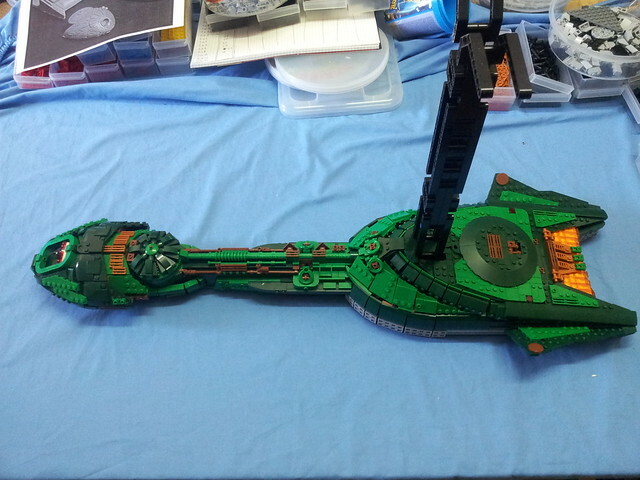 Does it rely on the stand to hold up the disruptor cannons? Kevin: This is another good point. The model itself is pretty strong and stable, but this made it regrettably really heavy. Because all the details are brick-built, very many little parts were used (which adds another pound of weight here and there). The part of the BoP which caused the most trouble with stability was the connection between head and hull. The neck is just 4 studs wide, in some places just 2. Kevin: As you can see, as well as being thin the neck is also one of the most detailed and therefore challenging parts of the BoP, which I had to rebuilt more than one time. Kevin: But I found a very good solution for it (see picture below). A long bar goes from the head section right to the rear – so nearly the complete length of the ship (1). This bar is fixed with pins to the hull (2). The wings are fixed via hinges to the hull (3) and to the bar (4). The attachment of the wings (5) is as well the point where upper rear hull (engine) and front hull are connected. This solution gives the BoP, while immensely heavy, good stability. Kevin: The rest of the stability comes from the presentation stand which the whole ship relies on (8). 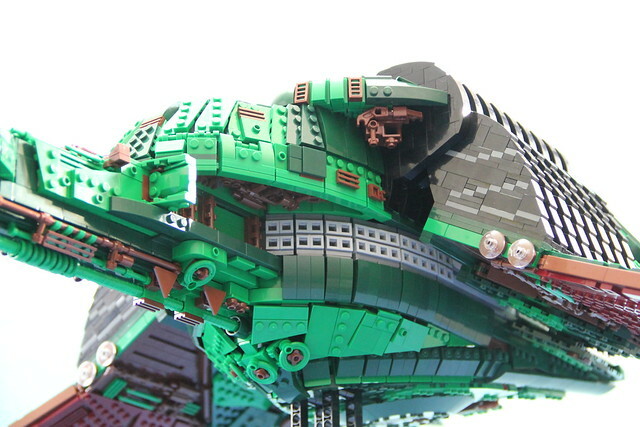 Most of the ship is standing on a massive 6×6 studs pillar which combines technic parts and normal bricks. The head, which is heavy as well, sits upon another pillar. SSS: Do the wings move? Kevin: Kind of. My intention was to show it in each of the three wing configurations (attack, flight, landing) but the wings have such an enormous weight including the disrupter cannons (which part of the BoP is not immensely heavy you now ask?!) that they can’t hold their own weight. Hence the wings each need a small stand to hold them up. 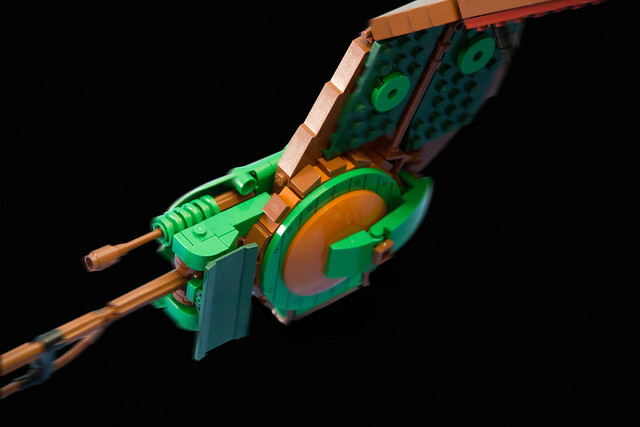 So to clarify: the wings can move, they would need a special wing-stand of their own for each configuration! So I had to decide which configuration I want to keep. The flight configuration would have been practical, because the wings form a straight line with the hull and only a flat stand would have been necessary. But I decided to go with the attack configuration, which is the most commonly seen position of the wings on-screen. However that means a stand with a height of nearly 50 studs! Initially I wasn’t sure if it would hold or would be secure enough. But since the wings have their own stand, the complete stand forms a cross and the weight is pretty evenly spread. Figuring out the exact position, angle and length of the wing stands was a bit trickier. I needed a spirit level to be sure that it was all lined up properly. SSS: Was the parts selection in greens and browns limiting? Kevin: No not really. A few years ago it would have been for sure, but back then the ship wouldn’t been possible at all due to the very limited parts selection. But nowadays the collection of greens, especially the normal green and dark green is much bigger. Those were the major colors, but browns also have a good selection of smaller parts which I used for details and for the appearance of the BoP as a rusty old battleship. SSS: I noticed the door of Bag End on the disruptor cannon, whose printing had a suitably Klingon vibe. Are there any other NPU’s your particularly proud of? Kevin: Yes some here and there. The plane cockpit parts were perfect for the head section, they had the perfect shape and the gaps were on the right place for details. Kevin: Or the green life-belt parts I used on the neck and the lower hull. And the last NPU is for me the complete section from neck to wings with all the different details and complex angles. Kevin: That is probably as well the reason why I’m to a decent grade proud on my BoP, because I achieved my goal to include as much details as possible and to capture the overall look of the original. SSS: Kevin is being modest. 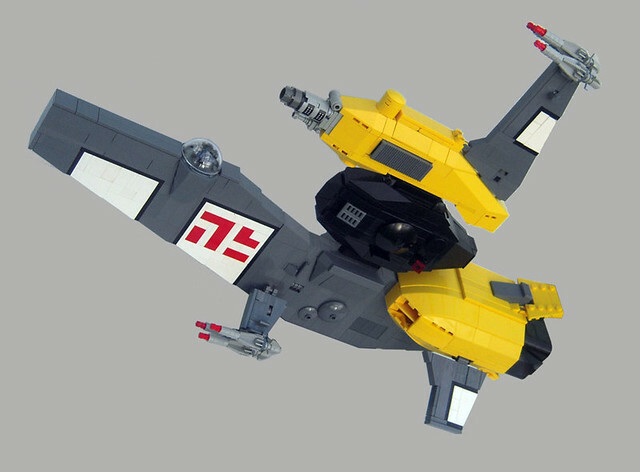 His model is certainly the best LEGO Bird of Prey in existence and probably the best Star Trek LEGO model in the world right now! The level of accuracy and attention to detail are mind boggling; and a worthy pay of to 15 years of dreaming. Now he just needs to build the Enterprise in scale with it! Be sure to check out his Flickr album for the all final and WIP shots. Thanks so much to Kevin for taking the time to answer our questions and supply these fantastic images! Kevin: I thank you for the possibility to answer you! I love the idea of a gigantic starship sailing through space to colonize a new planet; but what exactly are you going to DO when you get there? Sunder_59 knows the answer – you’re going to deploy all the specialist colonisation equipment the big starship brought with it, of course! Behold the Patriach Class Colonial Ship. 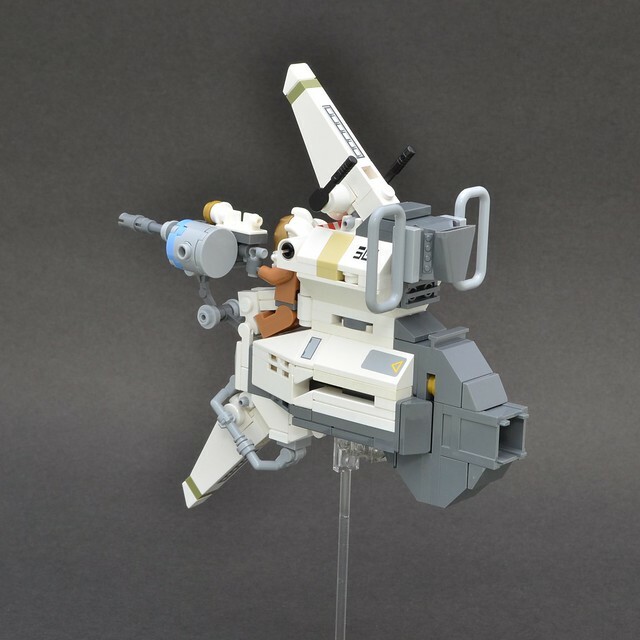 Firstly, this is an excellent MOC which uses some clever building techniques to achieve its shape. I particularly like the elegant slope of the nose which uses (I presume) the slight degree of bending available with lots of small pieces. The details are also great, like the centrifuge (?) section, the raised bridge and viewing area at the side; and I love the embedded hangar bay for little microscale shuttles. But it’s the thought that’s gone into the functionality of the cargo that really sets this apart for me. The builder has developed a series of cargo modules that fit nearly into the revolving racks on the underside and can be ferried down to planetary surfaces to build an entire plasticy colony! There’s what look like habitation modules, reactor units, cargo pods of different shapes and sizes and even little biodomes so they have something to eat. 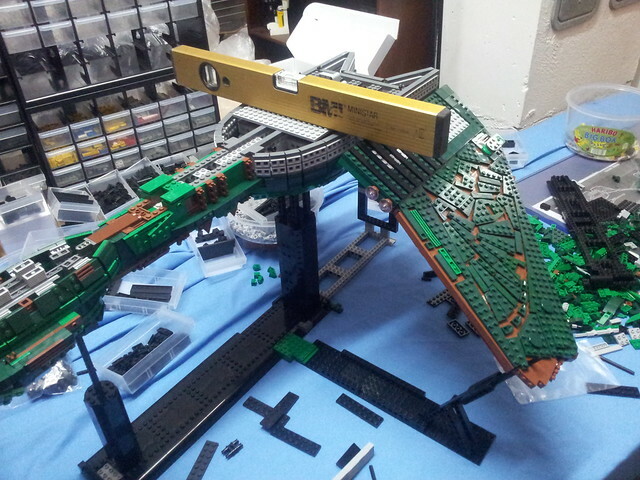 Check out some of Sunder_59‘s other pictures where the different modules are loaded into the ship for transport. 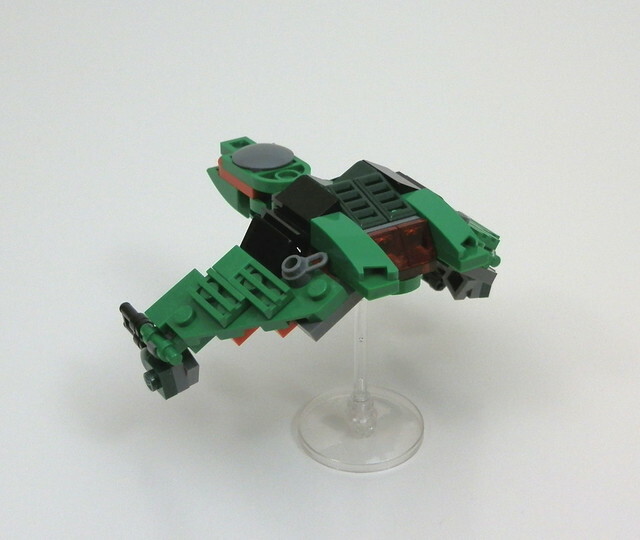 If I’m building a LEGO spaceship I generally think “is this going to be minifig scale or microscale” and get on with it; but Tim Goddard isn’t constrained by such rigid concepts: he’s built his Tigress Zero Gee racer at an even bigger scale entirely of his own invention! 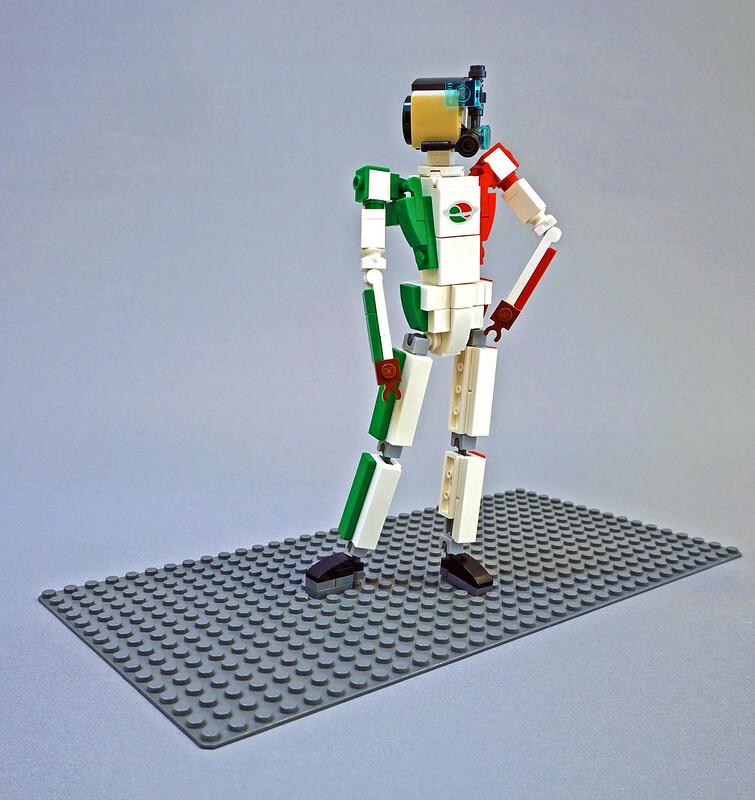 Meet Octana, the pilot; entirely brick built and standing (I reckon) about 22 studs tall, making her about 4 1/2 times the height of a minifig. I say “her” because she’s got a certain feminine poise. Working at this scale Tim has been able to include a wealth of detail to the figure and her craft that couldn’t be done at minifig scale. Witness the cockpit, which gives us all sorts of greebley displays, a steering yoke and a nice padded headrest for Octana to rest her head. In case you’re still confused, the windscreen of this thing is this gigantic panel piece that stands a full nine bricks high. 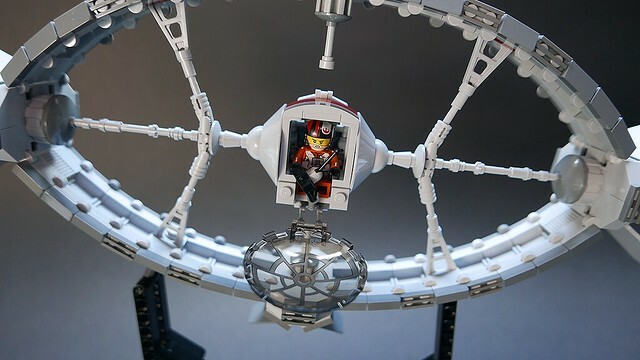 I reckon the whole spaceship is about 60 studs long! 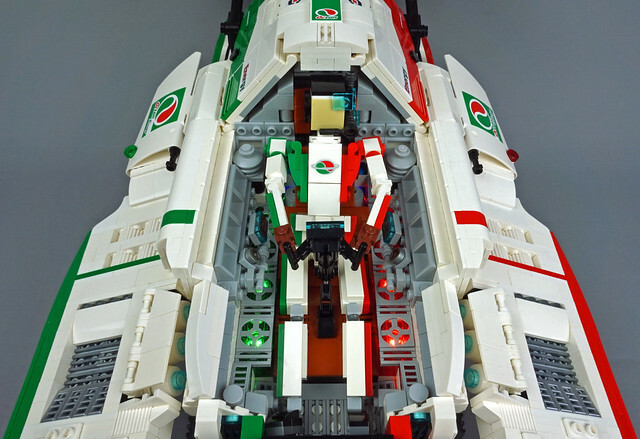 It’s a pretty awesome spaceship too, and of course Tim scores extra points for kitting the whole thing out with the colours and logo of Octan, everyone’s favourite fictitious fuel corporation and makers of voting machines etc. The 80’s TV series Ulysses 31 proper put the willies into me as a kid. It’s the bit in the intro where the computer says “The way back to Earth has been wiped from my memory…” utterly impassively; despite it dooming Ulysses to travel endlessly through space. Shiver. 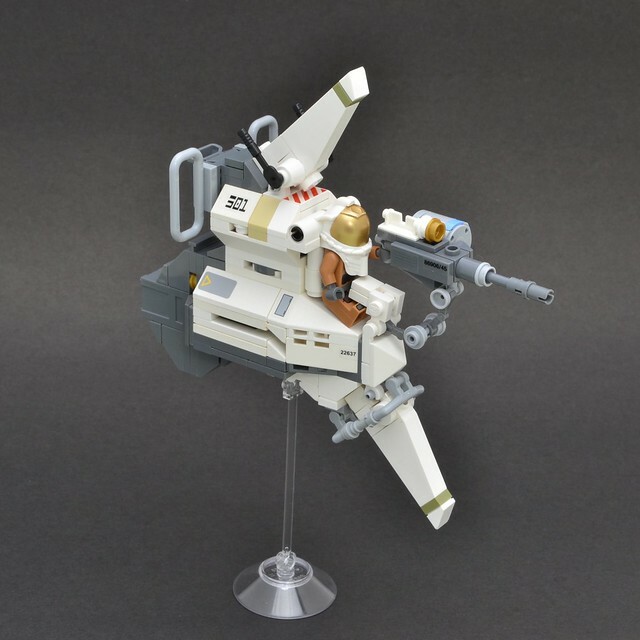 Whether thoughts like this went through the mind of GolPlaysWithLego when he built this LEGO spaceship however I can’t say. 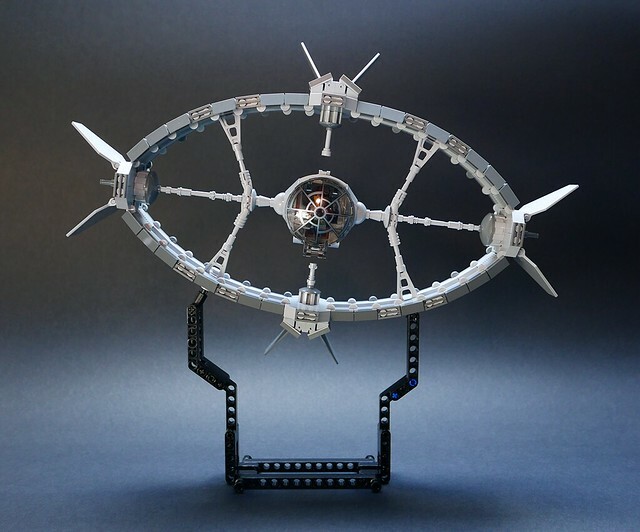 This actually isn’t the Odysseus from Ulysses 31 of course, because whilst it copies the overall shape the model is actually mini-fig scale and seats a little pilot in the middle bit; like a TIE fighter. Nonetheless, by using many pieces with small details around those central struts he’s given the model a great sense of scale and captured the overall shape really well. I was also really impressed with the custom made stand; which allows the model to be displayed at an angle; which really helps to emphasise the otherworldly nature of the design seemingly floating in space. Every now and again a MOC presents itself which I try to blog and realise I’ve got nothing to say other than “Oh my god that’s AMAZING!”. 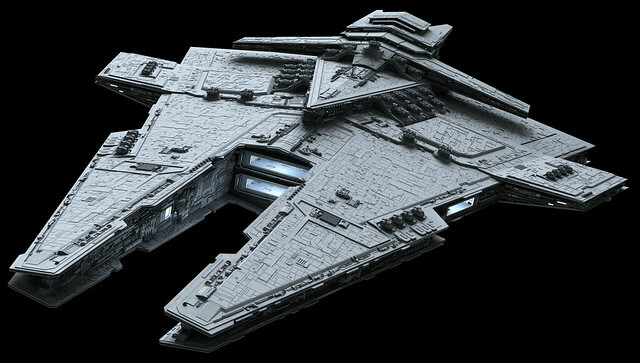 One such case was the Harrower Class Star Destroyer model by Koen Zwanenburg (Koen on Flickr). Not quite a SHIP at 75cm long and consisting of about 5,700 elements; it caught my eye not only for its extremely high level of awesomeness; but also for its near perfect flawlessness. 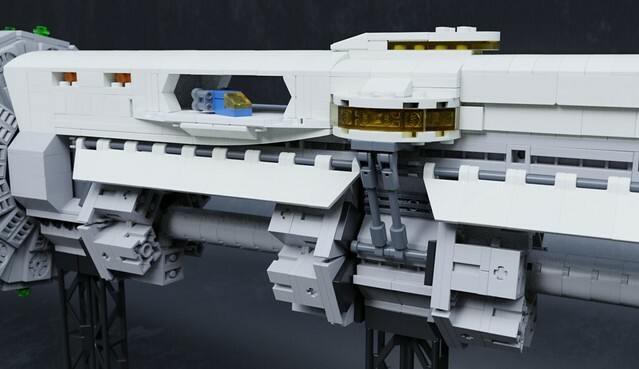 There’s hardly any exposed studs and nary a gap or seam to be seen, a feat of quite incredible engineering in a model with complex angles and which is based on “real” subject matter (below). Faced with a more questions than answers I reached out to the builder Koen to find out a bit more about his process. Read more after the jump. 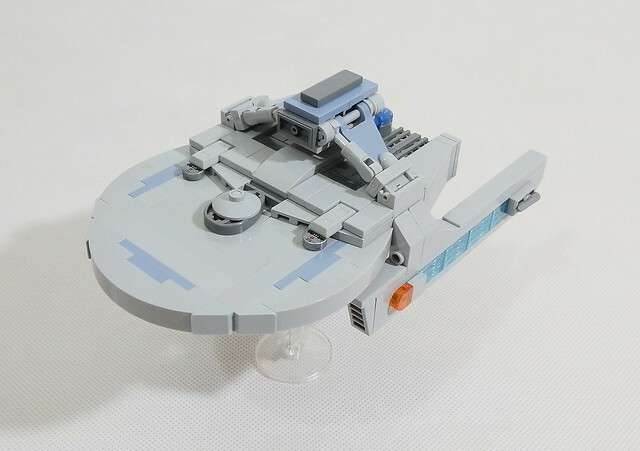 You know I’m a sucker for a good Star Trek MOC; and foxprimus101 has served up two. I’ve never been a massive fan of the USS Defiant, because whilst I really dig the role it played in Deep Space Nine and the idea of a purely combat driven starship is really cool; I think the design is a bit boring and could have been way cooler. This notwithstanding, this model is excellent at this tiny scale, capturing a host of detail and nailing the compact aesthetic. The USS Reliant however I DO have a ton of love for, as it’s featured in my favourite all time Star Trek film (and favourite all-time film if I’m honest) The Wrath of Khan. 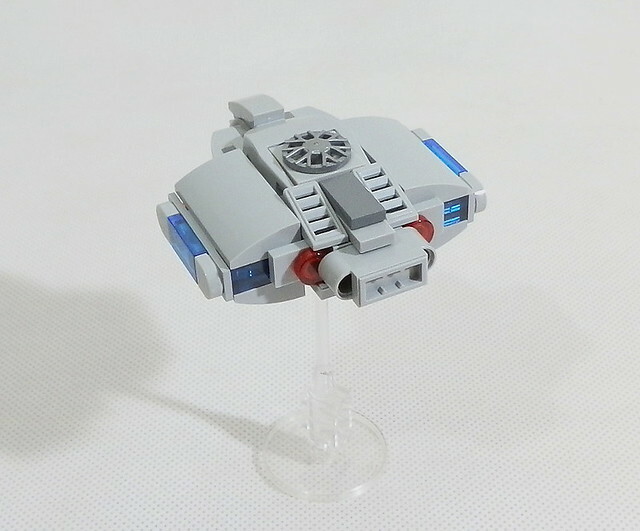 This model is also done really well, capturing the essence of this workhorse starship at a relatively small scale, with much of the essential detailing reproduced with a clever choice of parts. Amazingly, the Reliant was the first time in the Trek canon that another class of federation Starship was seen (which wasn’t identical to the Enterprise) and set the model for how alternative designs should appear. I kind of wish Defiant followed that template a little closer, retaining some of what makes Reliant a starship and not some kind of glorified shuttle. It’s 2017 already and still no jetpacks. At least .Tromas. has built one out of LEGO. Kinda. It’s not really a jetpack, in fact it’s a kind of spaceship I’ve not seen before; based on some concept art by Prog Wang. It seems to surround a spacesuited pilot entirely, but still let him manually point a big gun and flap his arms and legs about (presumably when he shoots something exciting). Tromas’ model is excellent, channeling the spirit of the concept artwork in blocky minifig scale and adding some awesome details. I particularly like the subtle and sparing use of colours to break up the white – the tan slope, those olive green 1×1 plates and a light blue 2×2 round plate; as well as some well-chosen stickers.